This fall, Wizards of the Coast brings a fifth adventure of their Dungeons & Dragons Player Handbook. Designed to hold just about every scrap of information you’ll need to successfully play the game, there’s a lot of information to be had. That information is streamlined into an accessible book that lets you easily find the information you’re looking for – or read it cover to cover – without needless complications. Whether you’re new to the game and want to do things right, or you’re an old school player looking to try out the newest iteration, there’s a lot to like in the newest Player’s Handbook. The book starts off by giving readers a bit of an introduction, both to the book and to the game itself. From there, it is a character creator’s dream of pretty much everything you need to know to create your perfect character for the game. The races and classes are covered quite in depth, with everything from common names to typical personality traits giving you real insight into what type of character would best suit you and your game. Each section of the races is prefaced by a book excerpt about one such character, really giving you insight into how they might behave (and some good book ideas as well). Once you’ve decided on a face, personality, and background for your character, you’ll want to look into equipment and customization options. Weapons, armor, tools, vehicles, and more are covered in depth, starting with a table outlining what you’ll start out with by class. For those interested in multiclassing (combining classes) and feats (special options), these are covered fully in Chapter 6, which gives an overview of how and when these optional customization options can be used (of course, the ultimate decision is up to your Dungeon Master). 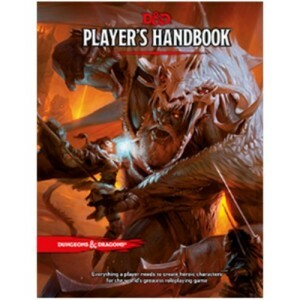 Part 2 of the Player’s Handbook covers practical game rules such as using ability scores, modifiers, and proficiencies, which has been streamlined for this edition. Proficiency bonuses apply across the board, ability scores are used for saving throws, and skills are tied to your ability scores. Adventuring and Combat each get their own chapters, covering everything from movement to order of combat in easy to understand terms. Part 3 of the book is solely devoted to spellcasting and spells, much of it devoted to individual spells and their usage. Finally, the Player’s Handbook ends with five appendices, covering Conditions, Gods of the Multiverse, The Planes of Existence, Creature Statistics, and Inspirational Reading (a well rounded list of books for players interested in immersing themselves fully into the RPG universe). The newest Dungeon’s & Dragons Player’s Handbook has a lot to offers to D&D players old and new. With an in depth look at virtually every character type, and everything you’ll need to effectively play the game, it’s a great book for gamers looking to get started in D&D. For experienced players, the newest iteration offers a welcome streamlined approach to the game.